Datatune's hosted antispam solution represents a new generation of cloud-based email security. It's easier, faster, accurate, and more flexible than traditional antispam mechanisms. And with our 100% Uptime Network, there's no safer solution. Find out why more businesses are switching to Datatune's hosted antispam solution. Datatune expands upon cloud email security by providing tools and functionality that enable you to interact with our solution as if it were a part of your own internal network. Now you can have all the benefits of the cloud, without the loss of control. 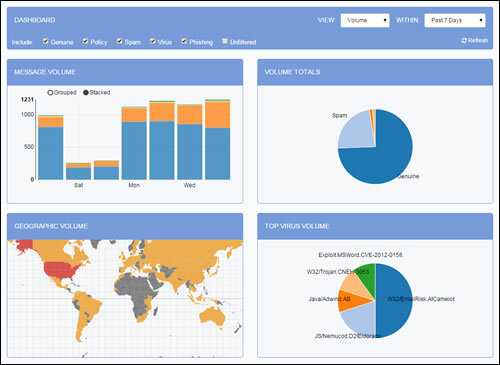 With a web-based administration console that looks and performs like a desktop software application, it's clear why administrators spend half as much time managing their email security with Datatune's antispam solution when compared to other cloud solutions. We guarantee 100% uptime, because we can. Our geographically redundant network enables us to provide unchallenged availability. Moreover, it means your email is safe with us. Leveraging real-time threat data from security firms such as Commtouch means we can identify and respond to new threats in seconds - not hours or days as is typical with traditional signature-based filtering methods. The console reporting dashboard enables you to design and export report data. Several additional modules within the console provide export capabilities allowing you to manage data on your terms. Our quarantine keeps junk messages where they belong - outside your network and off your Internet bandwidth. Yet with unique features like our RSS-Powered Quarantine Feeds, users can search for and locate quarantined messages from inside their own mail client. User management can be performed manually or automatically by leveraging LDAP to automatically keep your users up to date. With LDAP's automatic synchronization, there's no need to worry about manually creating new users on the anti-spam platform after you create them on your mail server. Additionally, users can use their domain password which authenticates against your LDAP server when logging into the console to reduce password management headaches. Feel free to contact us for additional information about our antispam services.